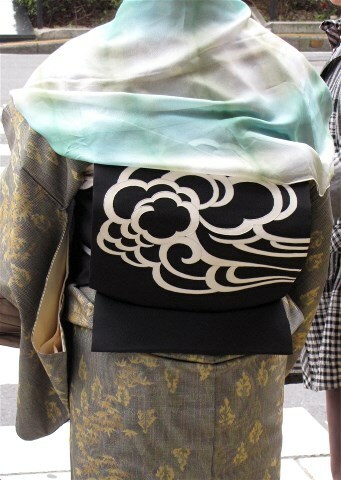 When I saw this obi (the waist sash around a kimono) I knew that one day I would use it in a haiku – it just seemed so different to the others that I had seen on my all-too-brief stay in Kyoto, which were mostly flowers, butterflies, leaves and embroidered balls. This obi design seemed so very strong, almost masculine (had it belonged to the wearer’s father? 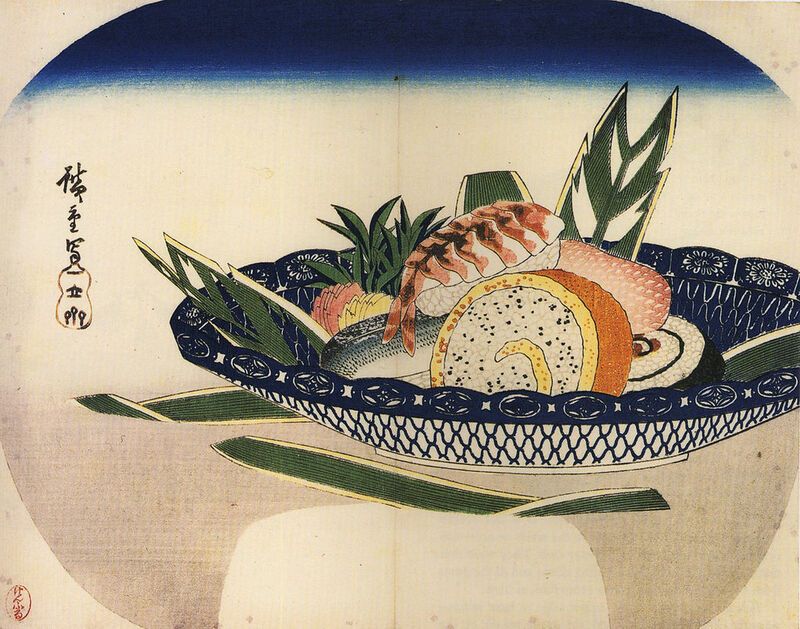 ), and it appears to be depicting something rough and tough, rather than something delicate and pretty. When I came to the word choice for my haiku, tsunami seemed to me to contain more possibilities for readers than, say, typhoon – after a quick online check the latter turns out to be a Chinese word (taifu in Japanese). The editor of NOON lives in Japan so, whew! Gion is an old area of Kyoto, best known for its geisha (called geiko in Kyoto). Westerners seem to think Gion is something akin to a red-light area but geisha are not prostitutes, rather highly trained entertainers who can be hired for an hour or a night (although I have played on the Western misunderstanding in my haiku). Trainees (maiko) are taught to sing, dance, play a musical instrument, understand Japan’s highly nuanced etiquette and be good conversationalists. 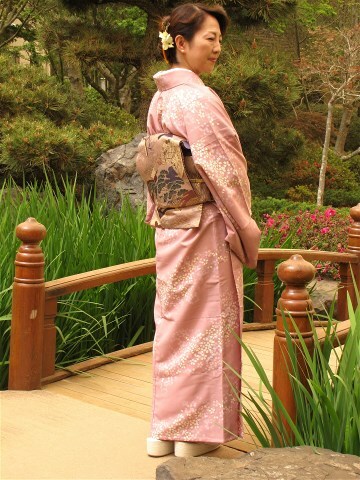 The one my group met had no questions for us after we had questioned her about her training and background, and the older geisha accompanying her advised (in Japanese) “next time have something to ask them”. 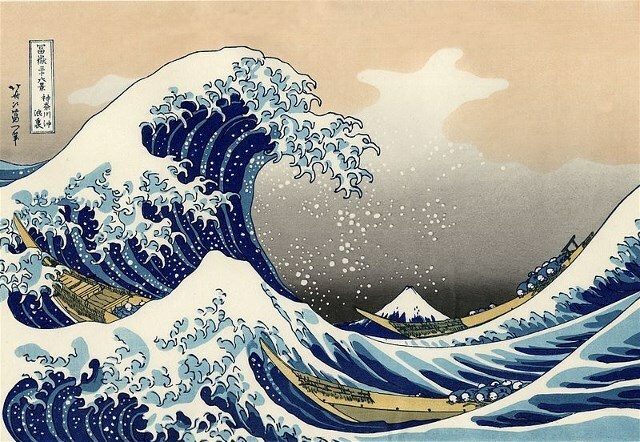 Made in about 1830, this woodblock print, often known simply as The Great Wave, was the first in the artist’s Thirty-Six Views of Mt Fuji and is now one of the best-known pieces of Japanese art in the world. 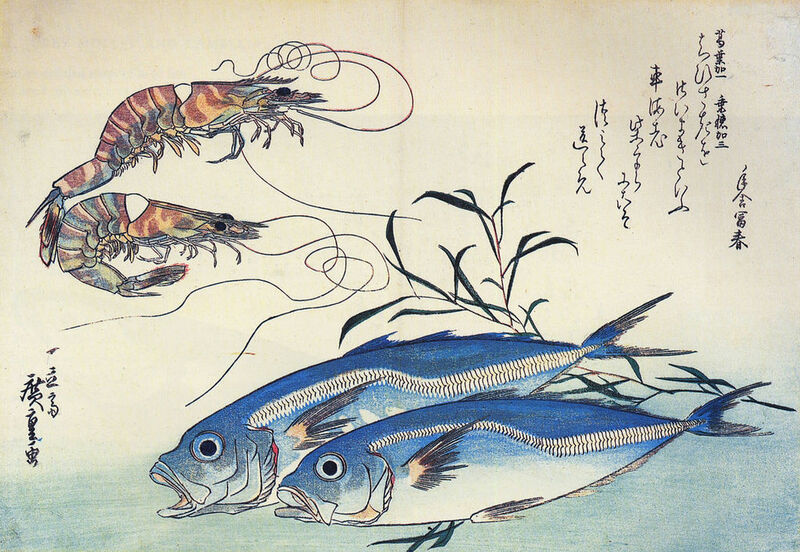 Adding to the popularity of this print at the time, was its extensive use of the new synthetic colour pigment Prussian blue, which gave a greater range of shades of blue and a greater depth of colour.